A little known chile in America, the ancho chili pepper is widely used in mexican food and has a fruity, smokey taste that adds great complexity to many dishes. With only 1,000 to 2,000 Scoville heat units, compared to 5,000 to 8,000 for the jalapeno pepper, ancho chiles are great flavor additions to many dishes. Ancho chiles are actually dried poblano chile peppers and the drying process imparts a nice smokiness to the chiles. 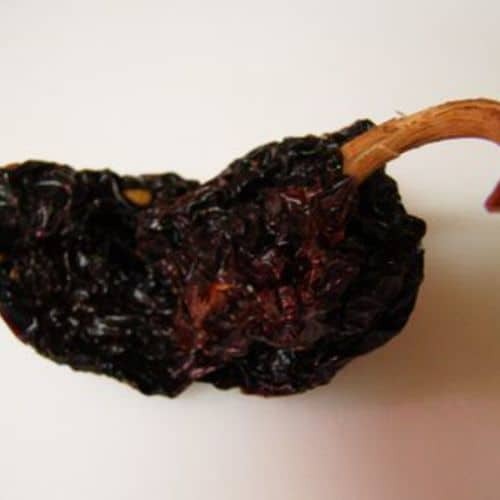 The chiles are a two to three inches wide and 4 to 5 inches long with a dark reddish-green, wrinkled skin. Ancho chiles are commonly ground into a powder and used in spice mixes or covered with boiling water for 10 to 20 minutes to rehydrate them. Learn more about these wonderful chiles to make unique dishes that will amaze your friends. Making your own ancho chili powder is a great way to use any ancho chili peppers you have. It is becoming more common in American cooking because of the wonderful smokey flavor and mild heat it can impart to dishes.